Danger: Can rope still be trusted? Rope is familiar and ubiquitous – and we assume it will behave like, well, Rope. It used to be true: knots could be trusted; a well tied knot did not just slide undone; unlike steel cable, rope tolerated bends and knots; rope did not melt; and, a small number of tucks made a secure splice. Admittedly, natural fiber wasn’t very strong and had to be replaced regularly – every couple of seasons for a tarred hemp halyard. But rope and its properties were familiar. Even now, fifty years later, I can close my eyes and savor the smell and the feel of new, tarred hemp rope. With all their benefits, some modern fibers have unexpected shortcomings; familiarity with their properties is essential. There are many designs for weaving a rope. Clusters of individual fibers form the strands. Several strands are woven in a pattern to form the rope. And, these ropes themselves can be used as strands and woven to make even larger ropes. The paragraphs below are not comprehensive. They describe the structures most commonly found when fishing, boating, climbing, and working around the farm or home. Most of these ropes fall into one of smaller number of categories depending on the number of layers and the weave. Three-strand (or four-strand) twisted: This is commonly encountered in boating, e.g., for mooring, dinghy painters, and anchor lines. “Z” twist is usual (see below). Unlike the various braids which follow, twisted rope under strain imparts a rotational force at each end. For heavy lifting, non-rotational ropes are preferable. Hollow Braid: This name was first introduced for loosely woven fishing line where the tail is passed up the center to form a “Knotless Loop”. Two sets of fibers progress around in opposite directions and weave into each other. The fishing line is “not hollow” in use. However, as it loosely woven the core space readily opens up. “Hollow” describes its behavior when it is being used to make a loop at the end of a leader. In marine and industrial use this splicing technique is called the Long Bury – a name we strongly prefer to “Knotless”. More recently, in marine and industrial use, “Hollow Braid” has been used to describe modern high-modulus braided 8-, 12-, and 16-strand ropes (and less commonly 20- and 24-strand). In these ropes the strands commonly progress around in pairs. Loose braiding and small braid angle enhance strength by minimizing kinking and compression of the strands. The common feature, just as with the fishing line, is that these ropes readily open up and become “Hollow” to allow the tail to passed through the rope. So, although introduced for fishing line, Hollow Braid is a useful description; on this website it will also be applied to larger ropes with this property. Solid Braid – Simple Weave: Again, two sets of fibers rotate in opposite directions but now a much tighter weave is used and the core does not readily open up for a Long Bury splice. This structure is used for many small diameter Nylon and Dacron lines sold for general use. It is also used for most fishing line – where ordinary fishing knots are normally used. Solid Braid – Solid Weave: Now, each fiber does not progress around the rope. It passes from outside of the rope to inside as a spiral interlocking with its neighbors, which makes a more solid rope. This structure is commonly found in general-purpose ropes sold in many hardware stores but not for high performance or specialty purposes. Unless you find a very loosely woven sample, it is not practical to use the Long Bury Splice. Double Braid: Double Braid has a braided core surrounded by a braided sheath. It is commonly used in yachts and dinghies of all sizes and is used for halyards, sheets, dock lines, fender lines, tow lines, and painters. The load is shared between the core and the sheath. The braided design provides a rope which imparts little or no rotational force under load. Double braided rope is therefore a better choice for lifting then a three or four-strand twisted rope. Kernmantle: This construction is generally used for climbing ropes. The name implies a tightly braided sheath, or “mantle”, which provides abrasion protection, around a core, or “kern”, which takes most of the load. The twisted fibers in the core provide most of the strength, e.g., up to 70%. (the image here is by David J. Fred and is used under Wikepedia’s Creative commons license). The ultimate strength of the rope’s fibers could only be realized if every fiber was straight, parallel to the rope’s axis, and equally loaded. These desirable objectives conflict with more practical requirements such as resistance to abrasion and ability to knot and splice. The fibers in loosely woven Hollow-Braid rope are all at roughly the same angle to the axis and this angle is quite small. Twisting and tighter braiding provide other desirable properties but they increase the fiber angle, which reduces strength. The Breaking Strain of a rope is the force required to break the rope under controlled conditions. For testing, each end of the rope is wrapped around a large smooth cylinder whose diameter is many times that of the rope to avoid uneven strain on the rope’s fibers. The load is applied slowly to avoid shock loading and heating due to friction. Several tests are made to obtain an average value. Some rope fibers, e.g., Vectran and Dacron, are almost unaffected by prolonged heavy loads. Other fibers, e.g., HMPE (Dyneema, Spectra) respond by stretching slowly under high loads. This is known as Creep. In some applications Creep is not critical. In others, e.g., stays for a mast, Creep can be a major disadvantage. Confusion: High Modulus is often confused with High Strength. 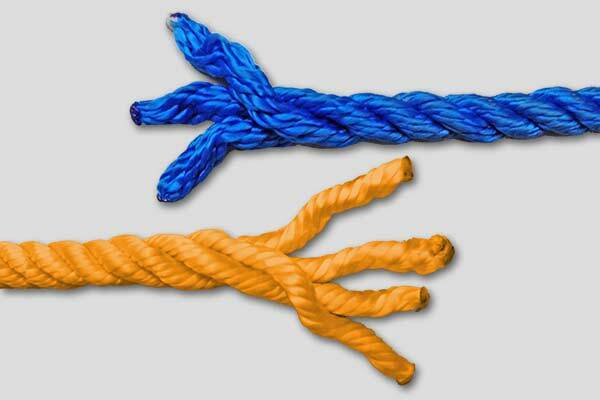 For rope this confusion is easily explained: new high modulus fibers are usually very strong. The two properties are, however, unrelated. Nylon, for example, is a low modulus fiber with considerable strength. Young’s Modulus of Elasticity measures the force required to stretch rope fibers. High values indicate large forces are required, i.e., high modulus means little elasticity. Although elasticity is highly desirable in some applications, e.g., an anchor rode or a dynamic climbing rope, elsewhere it is a disadvantage. Modern ropes with little elasticity are known as “High Modulus” ropes. Huge Values: The resulting value is usually huge, e.g., for an Aramid fiber M is in the range 70 – 112 GPa (gigapascals), or 10 – 16 million psi (lb/in2) and represents the force required to produce 100% extension for a “fiber” with a cross sectional area of one square meter – neither of which even remotely represents real experience for rope. Practical Values: A more useful value would employ units and forces relevant to the size of rope we handle, e.g., the force required (in tons) to produce 1% extension for a cross section of a square centimeter. For Aramid fibers this is around 10 tons/cm2 for 1% extension and over three times that is required to break the fiber. For Nylon the comparable value is about 0.25 tons/cm2for 1% extension but nylon can be stretched about 20% before breaking.